1) When did earth originate? Answer: The exact time is not known. Approximately it is 4600 million of years. 2) What was the state of earth at the beginning? Answer: It was a globe of burning gas. Answer: Huge sheets of ice moved down from the north and covered the earth’s surface. 4) How many ice ages have passed by this time? Answer) At least four ice ages. Answer: The warm periods in between the Ice Ages. 6) What is the shape of the Earth? Answer: A Greek astronomer in the ancient period. 8) What did Ptolemy think of the shape of the earth? Answer: The earth is flat. 9) When did life appear on the earth? Answer: About 700 million years age. 10) What were the first living things appear on the earth? 11) When did animal life come on earth? Answer: 500 million years ago. 12) What was the first form of animals? Answer: Those who live in the water like fish etc. 13) Give the names of animals according to the order of their origin. Answer: The animals living in water, then amphibian, then reptiles, then birds, then mammals. From mammals came man. 14) About half a million years ago, there were some creatures which resembled man. What are they called? Answer: Near man or sub man. 15) By what name the sub men were known? 16) What kind of life the Hominoids were leading? 17) The history of man is divided in to two broad divisions. What are they? 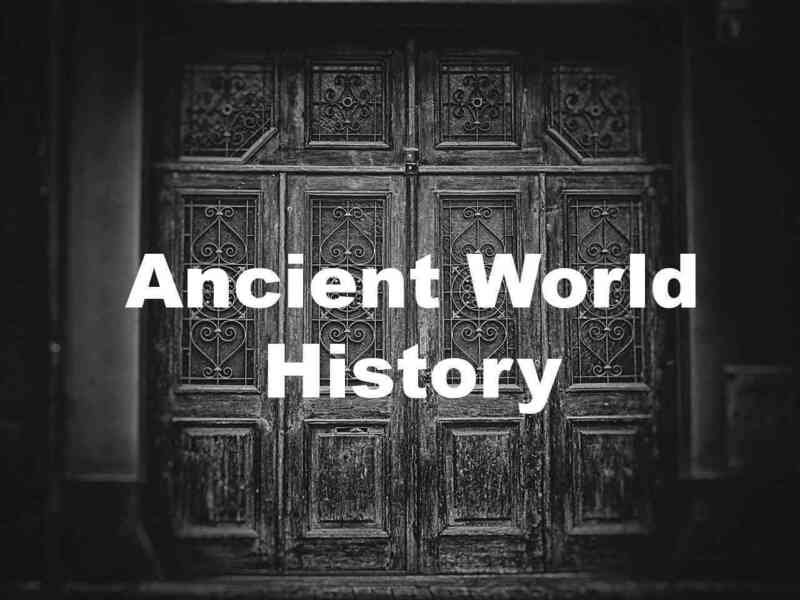 Answer: Prehistoric period and historic period. 18) What is Prehistoric period? Answer: No reliable source of history. 19) When was the Prehistoric period come to an end? Answer: Nearly by 3000 B.C. 20) The Prehistoric period is divided in to three. What are they? Answer: Paleolithic age, Neolithic age and Metal age. 21) Where does the word Paleolithic derived from? Answer: From Greek language. Palaeos means old, Lithos means stone. 22) What is the other name by which Paleolithic is known? 23) By which name the Neolithic age is known? 24) Why do the historians call this early period as stone ages? Answer: Stones are used as their main implements and it is this stone implements which tell us the history. 25) How did the Paleolithic men use stone as their implements? 26) What kind of life were the Paleolithic men leading? Answer: Food gatherers or hunters. 27) Where did Paleolithic men live in the beginning? Answer: On river banks in the open air. 28) In later Paleolithic period, what improvements did they make for their dwelling? 29) How did the Paleolithic people clad? Answer: Tree barks and animal skin. But often naked. 30) What kind of social life was the Paleolithic men leading? 31) How did the Paleolithic people clad? 32) How long did the Paleolithic period last? Answer: Probably from 30000 B.C. to 10000 B.C. 33) How did the Paleolithic men disposed their dead? 34) Where did we get information about Paleolithic men? Answer: From the skeletons, tools and paintings on the walls of the caves unearthed by the excavators. 35) Which were the main types of Paleolithic men discovered by the excavators? 36) What was the conditions of the above said groups? Answer: They are human like being, not real man. 37) What was the tool used by these early Paleolithic men? 38) Who was the best known man during the Paleolithic age? 39) Where did the skeletons of Neanderthal man find out? Answer: From Neander valley in Germany. 40) Where did the Neanderthal man live? Answer: They lived in caves. 41) What was the important discovery made by the Neanderthal man? Answer: The use of fire. 42) How did the Neanderthal man live? Answer: Hunting, fishing and gathering wild fruits. 43) What kinds of tools were used by the Neanderthal man? Answer: Knives, Spear heads, and throwing stones. 44) What kind of social life did the Neanderthal man have? Answer: Lived in groups having the strongest as their head. 45) How did they dispose the dead? Answer: They buried the dead. 46) While burying the dead, the clothes, tools and weapons of the dead man were also buried with him. What does it show? Answer: They had some belief about some kind of life after death. 47) When did the Neanderthal man live? Answer: Probably about fifty thousand years before. Answer: They were generally accepted as to be the most near to human beings. 49) What were all the qualities that the Neanderthal man did not have? Answer: They cannot stand erect nor hold their heads straight and incapable of speech. 50) Who were the important species of human beings lived on earth after Neanderthal men? Answer: They were Cro-Magnons and Rhodesians. 51) Why did the Cro-Magnons be called so? Answer: Their remains were found first from Cro-Magnon cave from France. 52) From where did the Cro-Magnons come to Europe? Answer: They might have come from North Africa or South Asia. 53) When did the Cro-Magnon exist on the earth? Answer: They existed about 35000 years ago. 54) The Cro-Magnons were superior to Neanderthals. What were the superior qualities they have? Answer: He was more so near to modern man in shape. They were tall and erect and more civilized. 55) Where did the Cro-Magnons live? 56) The Cro-Magnons were more artistic. What was the proof for their artistic taste? Answer: Pictures with many colors are still seen in the caves. 57) What was the social life that the Cro-Magnons had? Answer: Greater interest in family life. Families joined together and formed clans. 58) How did the Cro-Magnons dispose the dead? Answer: They buried the dead in strongly built caves. 59) What was the belief of the Cro-Magnons about the life after death? Answer: They had faith in soul and life after death. 60) Could the Cro-Magnons be able to speak? 61) What does their belief in soul and life after death show? Answer: They were having a form of religion. 62) Where did we get the skeletons of Grimaldi? Answer: Unearthed from the caves in Grimaldi in North Italy. 63) What was the state of Grimaldis in the evolution of man? Answer: A higher stage in the evolution of man. They were man in every sense. 64) Are Grimaldis not savages? Answer: They were savages of a higher order. 65) What was the native of the Grimaldis? Answer: They were more usual in nature. 66) What was the state of civilization the Grimaldis having? Answer: They were as civilized as the Cro-Magnons. Answer: The Rhodesians belong to Africa. 68) What was the cultural standard of Rhodesians? Answer: They were also having equal cultural standards like the other groups. 69) What was the cultural standard of the Paleolithic man in general? Answer: They were hunters, cave dwellers, and used unpolished stone weapons. Their society, their achievements in art and civilization were almost the same everywhere. 70) Where do the word Neolithic originate from? Answer: From Greek. In Greek, Neo means-New and Lithic means-Stone. 71) What is the other name used for Neolithic age? 72) When did Neolithic Age begin in Europe? Answer: In Europe from 10000 B.C. 73) When did Neolithic Age begin in Asia and Africa? Answer: Nearly from 15000 B.C. 74) The New Stone Age is considered as an important milestone in the story of human progress. Why? Answer: It was a great forward step on the long road of civilization. 75) What were the improvements that man made in the use of their tools and weapons? Answer: The stone tools and weapons were smoothened and sharpened by grinding. 76) What are all the variety of tools used by man during the Neolithic age? Answer: Tools made of wood, ivory and bone were found. 77) What was the greatest achievement during the new Stone Age? Answer: The development of agriculture. 78) What were the crops that the Neolithic man cultivates? Answer: Wheat and Barley at the beginning then Millet, Maize, and a variety of fruits and vegetables. 79) What was the method of agriculture followed by the Neolithic man? Answer: They were crude at first. 80) What were the implements used by Neolithic man in their agriculture? Answer: Plough drawn by oxen was used. 81) Where did the Neolithic gardens appear first? Answer: In Egypt and West Asia. 82) What compelled the Neolithic men to stay in one place? 83) What were the improvements that happened in their dwellings? Answer: They built houses to live in. 84) What were the types of houses the Neolithic man built? Answer: On the top of trees, in deep pits under the ground, and on the surface of water on wooden platforms. 85) What were the other improvements in the life of Neolithic man? Answer: Living in one place helped him to develop group living. 86) What helped the Neolithic man to co-operate one another and obey certain rules and laws? 87) When did man begin to tame animals? 88) What was the first animal tamed by man? 89) What all were the other animals that man tamed later? Answer: Wild goats, sheep, cattle, pigs, horse, monkeys etc. soon followed. 90) Where was cattle and sheep tamed first? Answer: In West Asia or Central Asia. 91) For what purpose, the Neolithic man used the animal? Answer: For food and as beast of burden. 92) Another important achievement of Neolithic age was? Answer: The art of making pots. 93) How did Neolithic man make their pots? Answer: They made it from clay. 94) What purposes the Neolithic man used his pots? Answer: To carry water, to store up grains and to cook food. 95) How did this Neolithic man cover their body? Answer: They learned the art of weaving. 96) How did the Neolithic man make clothes? Answer: From the hairs of animals and fibers of plants. 97) What helped the Neolithic man to make carts? Answer: The discovery of the wheels. 98) Which were the animals that Neolithic man used in drawing the cart? 99) The Neolithic man traveled through water also. What helped him in his travel? Answer: The invention of boats. 100) What were all the things the Neolithic man used in making boats? Answer: The skin of large animals and woods. 101) What kind of worship the Neolithic man followed? 102) What was the root cause of their worship? Answer: The fear of storm, floods, drought etc. 103) What was the form of their worship? Answer: By religious rites and sacrifices and worshiped stone phallus. 104) The Neolithic men were familiar with trade. What kind of system they follow? Answer: They followed barter system. 105) When did men begin to use metals? Answer: During the last period of the Neolithic age. Nearly by 6000 B.C. 106) What was the first metal found out by men? 107) Where was Copper used first? Answer: In Egypt and western Asia. 108) When was copper used in Egypt? 109) Which were the first copper mines in the world? Answer: Sinai and the islands of Cyprus. 110) During the last period of Neolithic age and at the early period of metal age both stone and copper were used by man. By what name that period was known? Answer: Chalcolithic age or Copper Stone age. 111) What was the defect of copper in making weapons and tools? Answer: Copper is very soft. 112) How did man in Metal age make Bronze? Answer: By mixing Copper with Tin or Lead. 113) When did man make Bronze? 114) Bronze replaces Copper for tools and weapons. Why? Answer: Bronze was harder than Copper. 115) What was the result of the discovery of Iron? Answer: Men’s artistic sense and skill increased. 116) Why did men use iron in the place of copper and bronze for making tools and weapons? Answer: Iron is harder for making tools and weapons. 117) When was iron discovered? Answer: Sometimes before 1350 B.C. 118) What was the result of the discovery of I iron? Answer: It made revolutionary change. 119) In India, only two metals were known. Which are they? 120) Which was the metal unknown to Indians? 121) What was the importance of metal age? Answer: It made tremendous progress in even walks of human life. 122) Men are divided into different races. What is meant by race? Answer: A group of people of the same kind. 123) Which are the main races in the world? Answer: The black or the Negroid, The yellow or Mongoloid, The white or Caucasian. 124) Today, racial purity is a myth. Why? Answer: All the races today became so much mixed up due to inter mingling and inter breeding. 125) Which race forms the largest division of man? 126) Which was the first language used by men? Answer: Some sounds which expressed emotions. 127) When did language originate? Answer: No exact date. It took a pretty long time. 128) What was the language used by the man during the early Neolithic period? Answer: It consisted of a few hundred words. 129) How did the Neolithic men express their feelings? Answer: Rejoice by dancing and sorrows by tears. 130) How did different language originate? Answer: People were separated by natural barriers. It results the appearance of many languages. 131) Which are the main Indo-European or Aryan languages? Answer: They are English, French, German, Spanish, Italian, Greek, Russian, Persian and Indian languages like Sanskrit. 132) What are the languages belonging to the Semitic group? Answer: They are Hebrew, Arabic, Abyssinian, Assyrian and ancient Phoenician. 133) What are the languages that can be included in the Hamitic group? Answer: The ancient Egyptian languages, The Barber languages, North Africa and East Africa. 134) Which are the main languages that included in Turanian group? Answer: The Lappish, Finnish and Magyar, Tartar, Manchu and Mongol languages. 135) Which are the languages that can be grouped under the Chinese group? Answer: They are the Chinese, Burmese, Siamese and the Tibetan languages. 136) What are the American Indian languages? Answer: The languages in different American countries. 137) Who are the people that use the Bantu language? Answer: The people of Central Africa. 138) By whom are spoken the Malayo-polynesian languages? Answer: The people of Malaysian countries. Some other languages like the Dravidan languages in south India also come to this group. 139) How did the art of writing develop? 140) Where did the alphabets originate from? Answer: From Hieroglyphics and Cuneiform writings. 141) What kind of writing was Hieroglyphics? 142) Why was that form of writing called Hieroglyphics? Answer: It was used by the priests in Egypt, which meant Holy pictures. 143) When did the Egyptians invented this form of writings? 144) Where did the Egyptians write? Answer: At first they carved on stones. Later they invented paper and wrote with the help of a kind of pen and ink. 145) Who were the people which developed the cuneiform writings? Answer: The Sumerians in Mesopotamia. 146) Where did the Sumerians write? Answer: They used to draw on clay plates. 147) What kind of writing was cuneiform writing? Answer: They used symbols, to represent a sound. 148) What kind of writing was that developed in China? Answer: The Chinese also used pictures like the Egyptians. 149) How did alphabet develop? Answer: The Phoenicians blended Hieroglyphics and Cuneiform systems of writing and developed the first form of alphabet.